Warning: While it's possible to switch the Asana account that DigiSpoke uses to access Asana's systems, for security reasons, you will be required to unlink the current user's Asana workspaces. Unlinking an Asana workspace will delete all dependency, time and progress data. * The workspace and any associated teams, projects, tasks, etc.. will remain in Asana. Select "Unlink Asana Workspace" Warning: this will delete all dependency, time and progress data for this workspace. 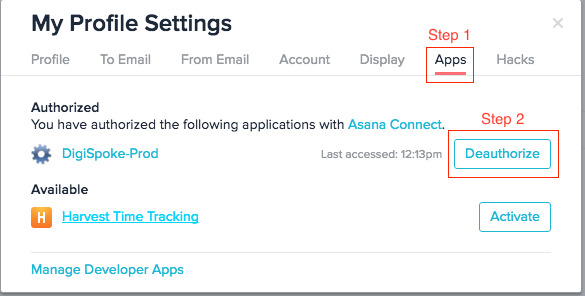 In Asana, access your Settings by clicking on your name in the upper-right corner and selecting "My Profile Settings"
Locate the DigiSpoke-Prod entry and click on "Deauthorize"
Click on your name in the upper right hand corner of the screen and select ‘Account Settings’. The account settings window will appear. *By saving critical workflows as templates, you may reuse them at a later time or in a different workspace.